How impressed should you be by China overtaking the United States as the world’s largest importer of crude? The answer is quite a bit, but maybe not as much as you thought. China imported an average 8.55 million barrels per day (bpd) in the first half of 2017, above the 8.12 million bpd by the United States, according to government figures from both countries. The obvious takeaway from this is that the data highlights the shifting dynamics of the crude oil market, with Asia replacing the United States and Western Europe as the main demand center, as well as the source of most of the growth in oil consumption. However, this trend has been in play for several years. All that has changed is we now have a set of numbers that confirm what was already known. What is more important is trying to understand the underlying drivers of Chinese crude demand and how these may develop in coming years. There are a few factors that, when taken together, give a slightly different perspective on China’s rise to the top of global crude importers. These are China’s ongoing, and significant, purchases of crude to fill its strategic reserves, the rise of its refineries as major players in the regional export markets for products, and the decline in China’s domestic oil output. China doesn’t provide regular numbers for its strategic storage program, so the best way to estimate how much crude is flowing into tanks is to look at the total amount available from imports and domestic production, and subtract the total processed by refineries. In the first half China’s imports were 8.55 million bpd and domestic output was 3.89 million bpd, giving a total amount of available crude of 12.44 million bpd. Refinery throughput in the January-June period was 11.1 million bpd, an increase of 3 percent on the same period in 2016. This means that the gap between available crude and the amount processed was 1.34 million bpd. Not all of this will have flowed into strategic storage, some will have been used to fill commercial inventories held by refineries. But even so, the figure is well above the 830,000 bpd surplus crude recorded in the first half of 2016. The numbers imply that about 510,000 bpd more was flowing into storage in the first half of 2017 compared to the same period last year. Given that the increase in imports in the first six months in volume terms is 1.07 million bpd, this implies that half of the gain has been added to either commercial or strategic storage. China’s exports of oil products have also risen sharply in the first half, jumping 10.2 percent to 23.66 million tonnes, according to customs figures. This equates to about 1.05 million bpd of exports, using the BP Plc conversion factor of 8 barrels to a tonne of refined products. This is about 106,000 bpd more than the 944,000 bpd of product exported in the first half of 2016, confirming that some of the increase in crude imports this year has made its way out of China as refined fuels. The third factor is China’s gradually declining domestic crude output, which fell 5.1 percent in the first half of 2017 to 3.89 million bpd. This is down about 180,000 bpd from the same period last year, meaning some of the additional crude imports have merely replaced declining local production. This is an important point of difference to the United States, where domestic production has risen strongly in recent years as shale oil became economical to extract. Adding together the additional crude flowing to storage in the first half of this year, the increase in product exports and the decline in domestic output gives a total of just under 800,000 bpd. This means that the actual increase in crude oil imports to meet growth in consumption is around 270,000 bpd in the first half of 2017 compared to the same period last year. However, does it really matter for global oil markets how the Chinese use the oil they import? It does insofar as to how sustainable is the growth rate of imports. It’s likely that China will continue to fill strategic reserves for several years to come, but at some point purchases for this purpose will taper and then stop altogether. How much more can Chinese refiners export as products? Probably several hundred thousand bpd more than they do currently as they have spare capacity. But whether they actually will depends on the ability of regional product markets to absorb additional Chinese supply, and whether the authorities in Beijing continue to increase crude import quotas for smaller, independent refiners. And the final question is whether China’s domestic output will continue to decline, or whether it will stabilize, or perhaps even recover somewhat as the state-owned majors put more cash into exploration and enhanced recovery. 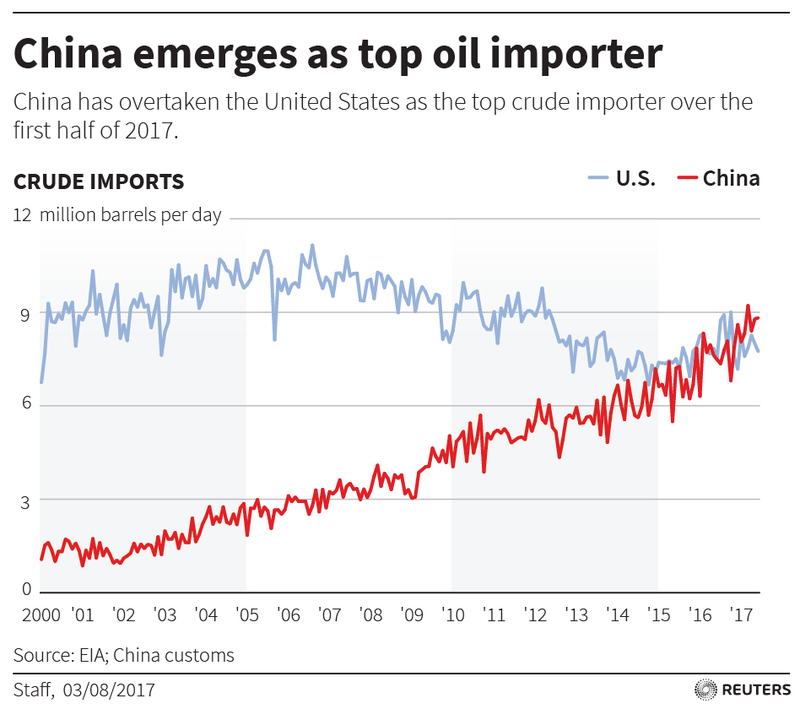 For the foreseeable future China is likely to maintain its lead over the United States as the top crude importer, but the story is more than just one of strong economic growth in China.